Planting a tree is a simple thing. We plant them for their beauty, and maybe to create shade. I haven’t thought about trees as a poverty elimination tool. Oil palm, teak, citrus, guava and mango seedlings are shielded from the hot sun in a tree nursery. But this is what Paramount Chief Charles Caulker and the Center for Community Empowerment & Transformation (CCET) have in mind for Bumpeh Chiefdom. They plan to plant 15,000 trees in villages each year for five years. In doing so, they will provide economic empowerment for villagers to improve their own lives and escape poverty. 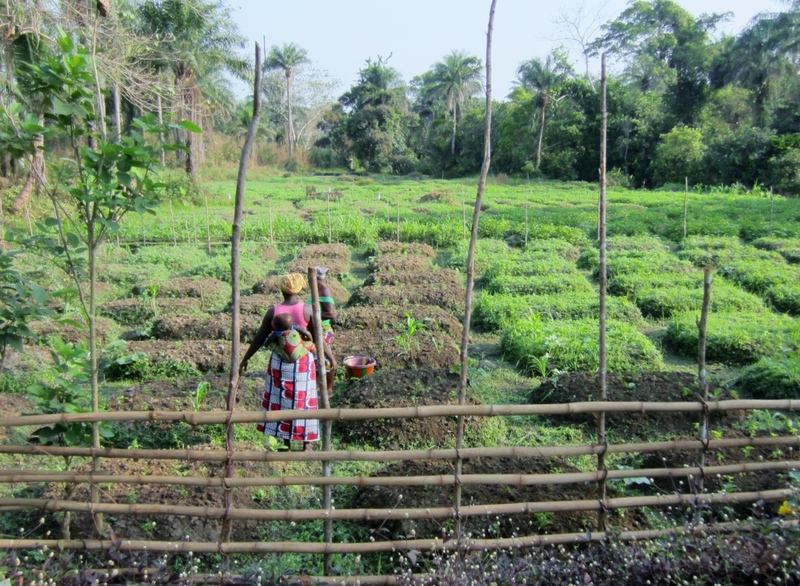 Bumpeh Chiefdom is one of the most rural areas of Sierra Leone and agriculture is their bread and butter. It’s a subsistence agriculture area where people barely grow enough to eat, often falling short before the next harvest. With most of the people living in small, remote villages, it’s a place that receives few government and NGO development programs. The trickle down to their level is small and slow. So, Paramount Chief Caulker is taking on poverty reduction himself by building on his chiefdom’s strengths of rich land, good water sources and agriculture know-how. With the chief as their sponsor, CCET has started a tree nursery to raise trees with economic value. Oil palms, coconuts, teak and a range of fruit trees – orange, grapefruit, lime, guava, mango, avocado, banana. 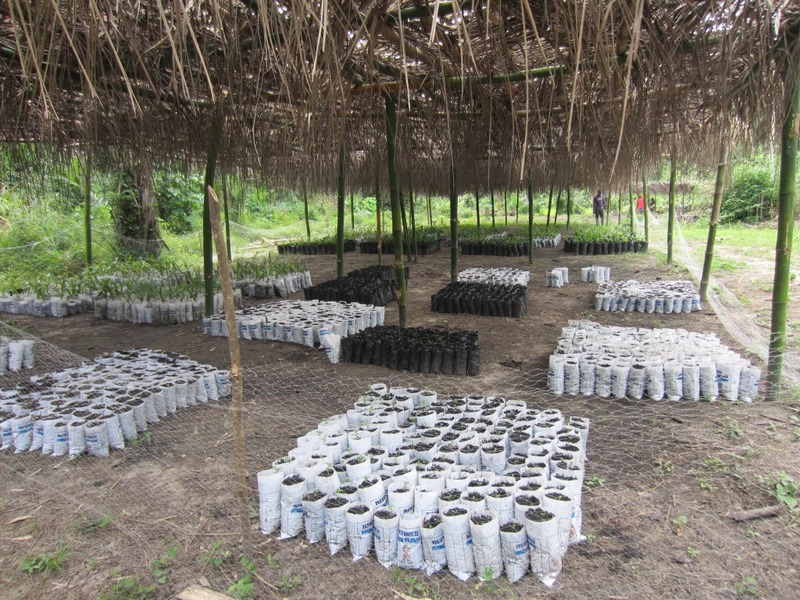 Tree nursery now holds 8000 seedlings. 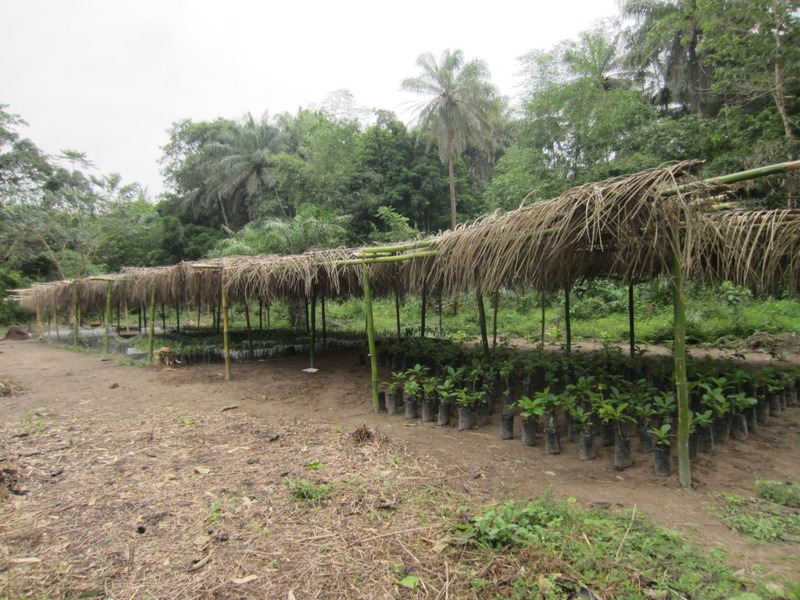 They are purchasing small seedlings for trees that are more difficult to start, like oil palms, coconuts and teak. Others they are starting themselves from seeds, seeds you literally spit out when eating an orange or grapefruit, or pits collected from avocado and mangoes. They’re planted in deep polythene bags with rich swamp bottom compost, and they quickly germinate and thrive in the tropical heat and humidity. The nursery is set up on land donated by the chief, made of local materials and set up with volunteer labor. The ground was brushed with machetes and bamboo stakes cut to make long pergolas. When covered with palm branches, the pergolas provide the right amount of filtered light for young seedlings. 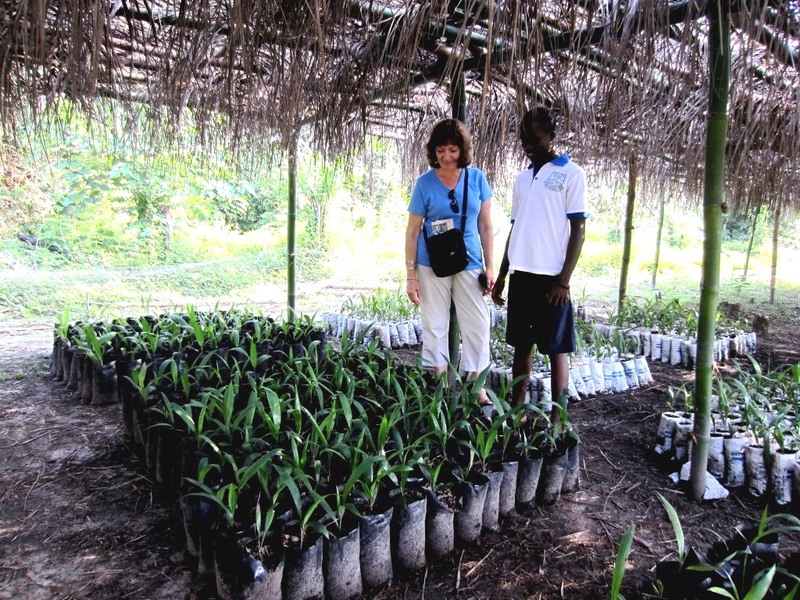 Arlene and CCET Volunteer and teacher, Abdul Phoday view oil palm seedlings. The plan is that each year for five years, 30 villages will set aside ten acres of community land for their own orchard. Come planting season with the start of the next rains in June, each of these villages will be given 600 trees to plant. It’s their job to plant and maintain their community orchard. 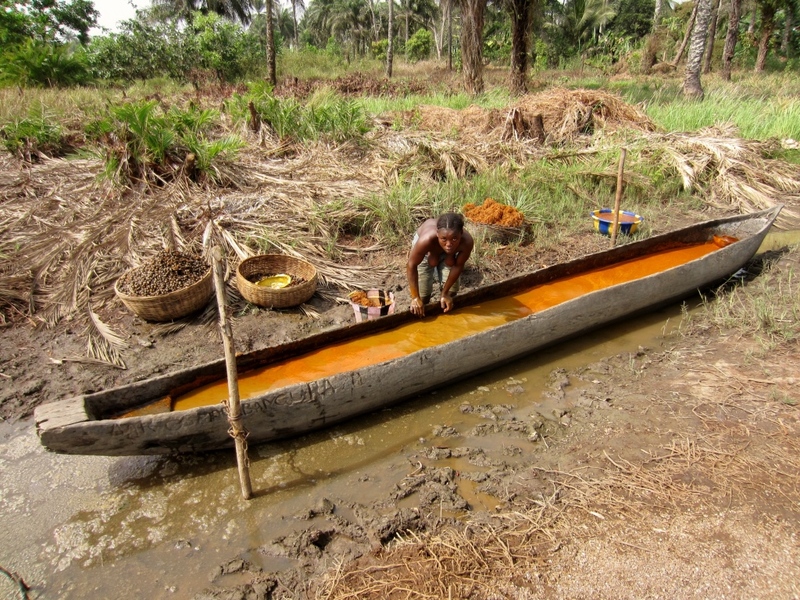 In five years, 150 of the chiefdom’s 208 villages will be covered. The village will get the income from selling the fruits of the trees, and eventually the teak lumber, to use for development projects of their own choice. I asked how much money is to be made with fruit trees like this. I found it’s quite a lot. Using an orange tree as an example, the tree will mature in about 4 years and it commonly produces at least 1000 oranges a year, often more. 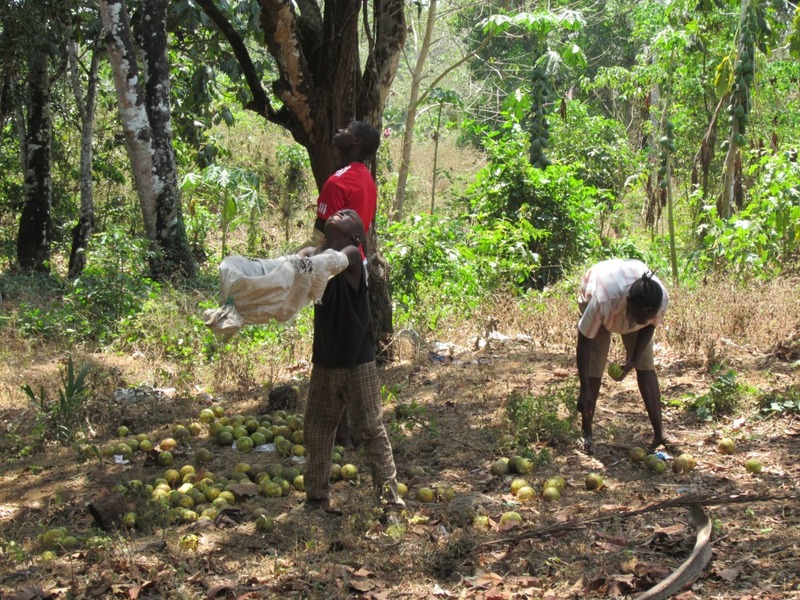 If 600 orange trees are planted and reach maturity, they will yield enough fruit to fetch in Freetown Le500,000 ($120) per tree – or Le 300,000,000 ($72,000) per year for the whole community orchard. Trees continue to bear fruit, so this is Le 300,000,000 for the community year after year. Even if not 100% successful, or if fruit is sold at lower upcountry prices, the orchards will generate a lot of much needed cash for these communities. Chief Caulker’s father planted grapefruit trees fifty years ago that continue to bear a lot of fruit. Multiply by 30 villages and the tree nursery’s first crop of seedlings and this is a big income stream that continues each year. Individual farmers can build small businesses. Money can also go to build village schools and health clinics, dig wells, start community cooperative stores and set up internal microfinance programs at little to no interest. Villages choose what they each need. This is transformation from the grass roots level. With self-managed programs and almost no overhead costs, it all goes to the community. As the tree nursery program expands, more villages will get their trees and the net value of this program to the chiefdom will only grow. Newly planted coconut orchard a few months old. At an initial project cost that today equates to Le1000/seedling, or Le 600,000 per village orchard, this is a 500% return on investment within four years when trees reach mature fruit bearing capacity. Not a bad return from polythene bags and bamboo shelters. This return on investment – and the sustainability of the program – is possible because of a very important program element: local ownership. This program is conceived and led from within the chiefdom. No outside organization is coming to implement an outsider’s program. 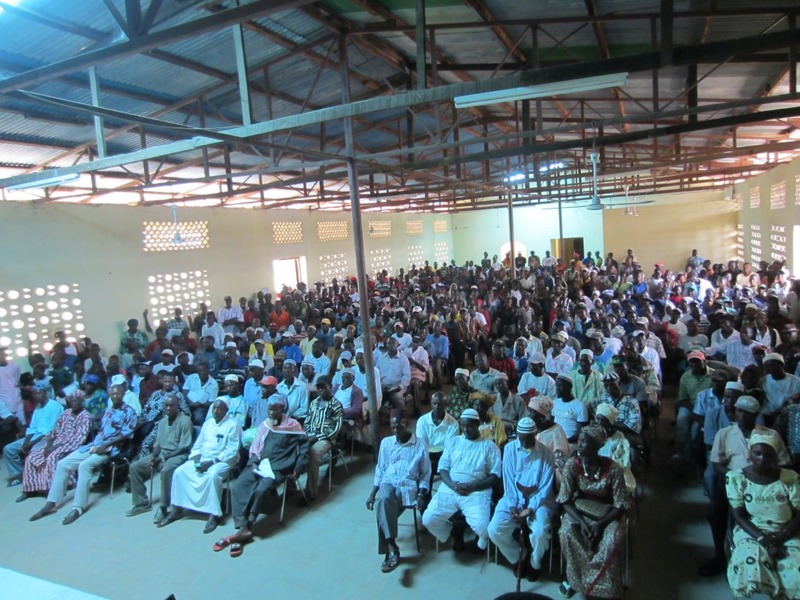 Chiefdom leaders and rank and file gather to hear about CCET projects, including the tree project. CCET identified their own community needs and designed the program to be managed across the chiefdom using existing chiefdom administration as the most reliable vehicle to reach the people. 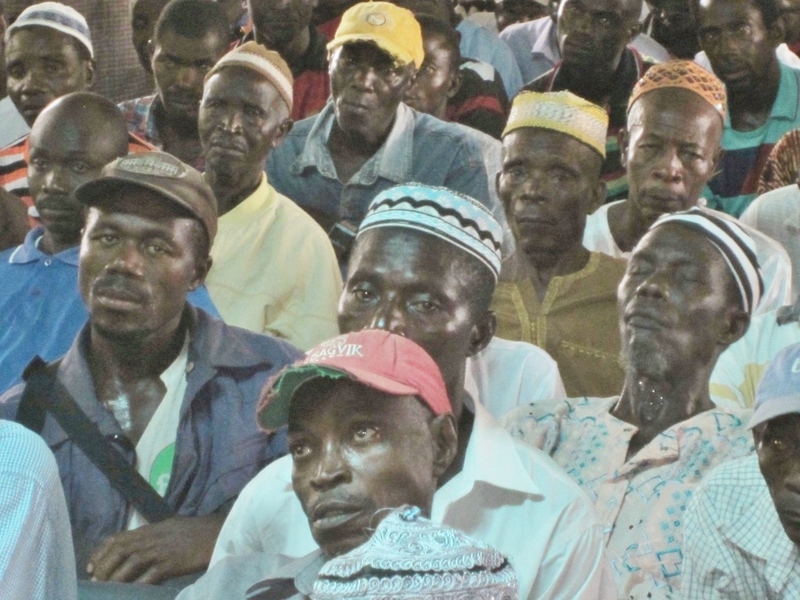 By using traditional chiefdom leadership roles and communication systems, they can quickly cascade down to the small village level and be readily accepted. Village headmen are responsible to organize their own community orchard. They get direction and oversight from their section chiefs. These are traditional chiefs who are chiefs for life, and well known and trusted by their people. The paramount chief oversees the whole program in the course of his normal chiefdom business, and using his established chiefdom council. I asked Chief Caulker how does he know the program will be managed as conceived. 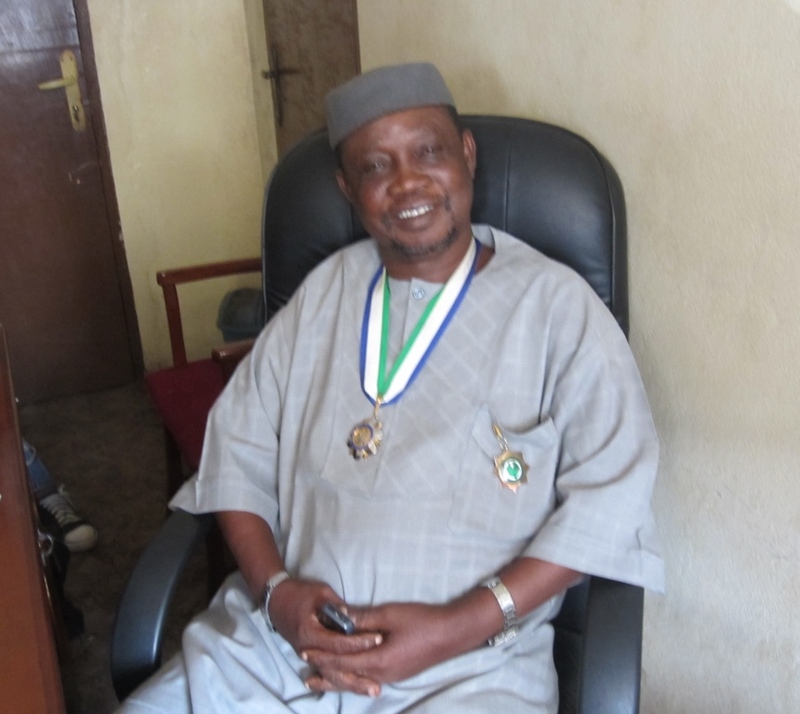 We’ll write practices governing the planting and harvesting of trees into chiefdom and village bylaws, he said. If people don’t follow them, they will be fined. People have little extra cash, so they fear getting fines and abide by the bylaws. The chief has also embarked on a formal and informal educational program to positively reinforce the value of trees and encourage people to plant their own. The chiefdom bylaws will include environmental practices that designate water catchment areas where trees are to be planted to protect the water table. People and the environment are inseparable, Chief Caulker said. Any attempt to improve one at the expense of the other will ultimately fail. We have a desire and responsibility to protect the environment, but our approach is different. Instead of targeting an environmental program, we integrate environmental protection into everything we do. The tree planting program will do our part to fight global warming and will protect our water resources. Programs led by the chiefdom eliminate the need – and cost – of introducing new staff and bureaucratic systems subject to failure. The pride of local ownership has stimulated people to participate and volunteer. They want to be involved and to help each other. And because these are simple, transparent programs, they can. The work goes quickly, at low cost and with ready acceptance. This is empowerment from the bottom up. Many government and NGO led programs either take a long time or never reach the small village level where the need is the greatest. Within one year from its conception, CCET is doing this. With a blend of modern technology and traditional practices, it is already paying dividends and promises to only lead to more success. 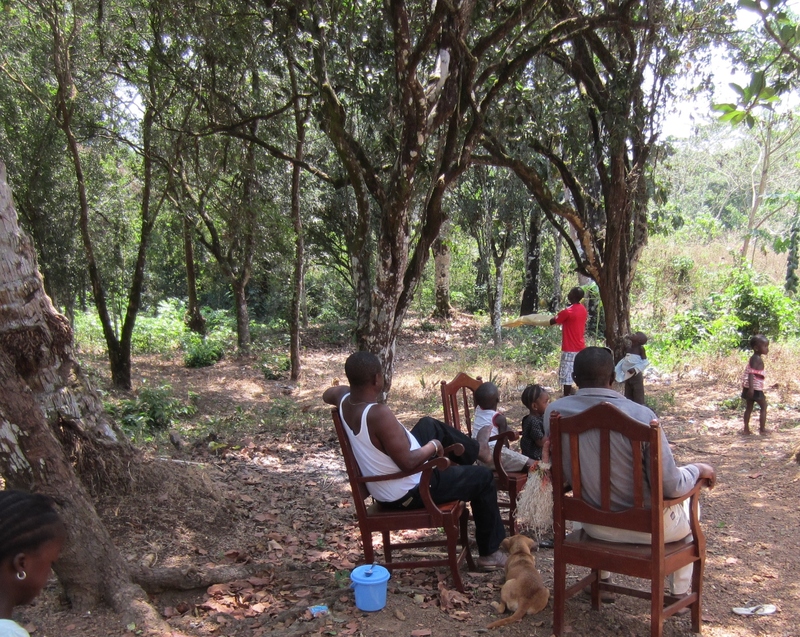 Chiefdom men learn about the promise of planting trees. I asked a young man what he learned from the launch meeting where the tree program was introduced to people in the chiefdom. He said, young men learned about their future and what they can achieve with planting trees. In five years, they can improve their future. Planting trees is a common thing. Anyone can brush their land and do this in one week. Young men downriver have land to plant 10 to 20 trees for themselves. Now they have the zeal to do it. Using agriculture and planting trees is an interesting thing, he said. A tree is your child and you must take care of it like a child. It will give you its children – its fruit – to eat. It’s not ungrateful like your own children. A tree will always be there for you. Tree planting will be the support for all other programs we do – for our children, for education, for environmental protection. I later heard the Paramount Chief telling a young section chief, I wasted my time as a young man without planning for my future. You need to plant trees now for your retirement and for your children to inherit. Every man and woman in Bumpeh Chiefdom should be planting trees. Poverty elimination by planting trees. At the program launch meeting Chief Caulker said to his chiefdom, I’m a farmer and I take this challenge personally. I believe it will make a big difference in peoples lives. By building on traditional agriculture practice and social norms, we can be proactive in empowering the vast majority of people down to the small village level and get started quickly. Treating agriculture and tree orchards as a business is indeed a practical and achievable way for Bumpeh Chiefdom to lead its people out of poverty, and into a middle class existence in the not too distant future. CCET-SL volunteer and local teacher Mr. Sennessy (left, blue shirt) and Mrs. Kaimbay, CCET-SL Director and local principal, right, watch as a young volunteer prepares her seedling bag. 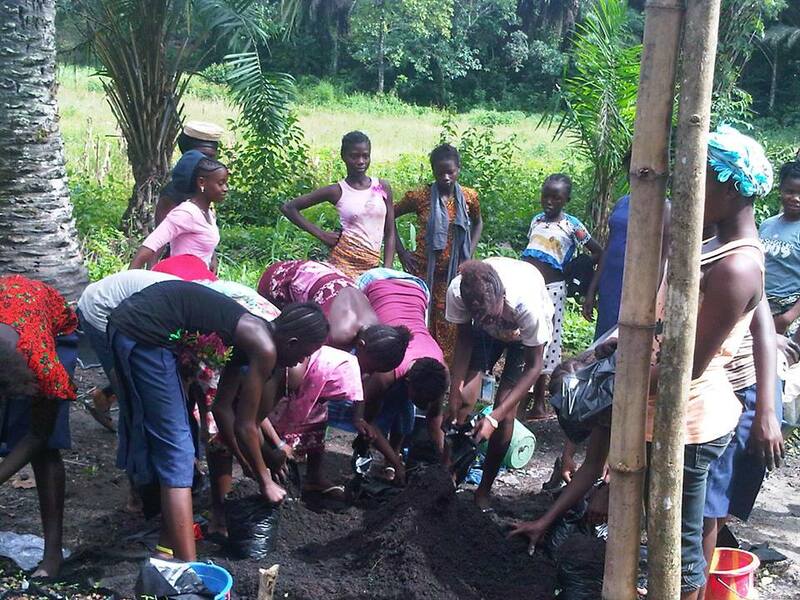 It’s the rainy season now in Sierra Leone and planting time. 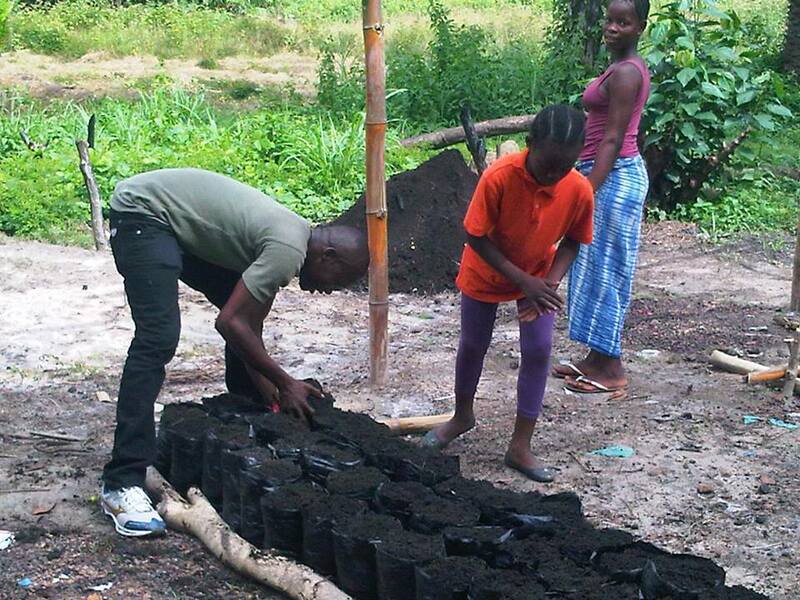 Rotifunk is busy planting tree seedlings to raise in their nursery for trees of economic value. Thanks to cell phone pictures and Facebook, we can all now see the nursery taking shape and seedlings growing. The tree nursery is a project of Rotifunk’s home grown nonprofit organization, the Center for Community Empowerment and Transformation. CCET-SL’s aim is to empower their community in development with projects like the tree nursery. With these projects, they hope to transform lives of the average person in Bumpeh Chiefdom. I shouldn’t say they hope to transform lives. They plan to transform lives. With simple, concrete projects like the tree nursery that will have clear payback, this isn’t a leap of faith. Next year, the trees will be ready for people to plant in their own gardens and farms to improve their family’s diet and gain income by selling their surplus. 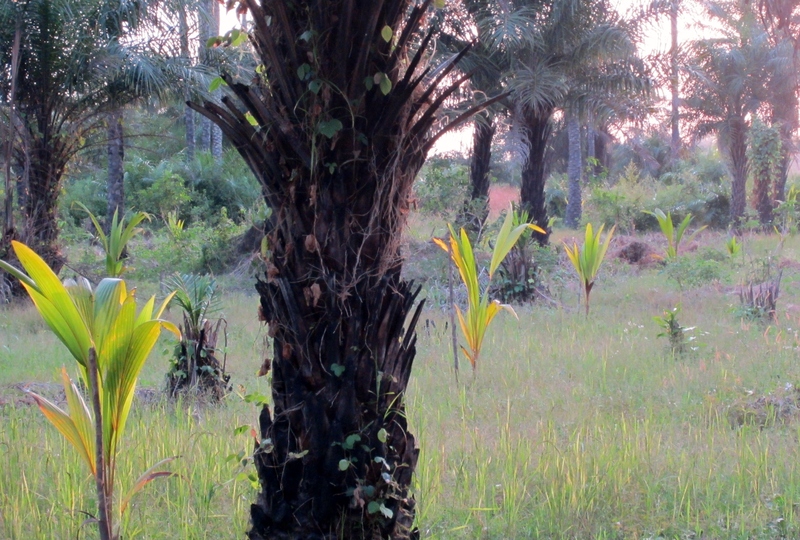 Citrus, coconut and oil palm trees, as well as teak trees for future lumber sale. Bumpeh Chiefdom is a rural area rich in agriculture. So, economic development here starts with agriculture projects. To read the whole story about the Economic Tree Nursery, click here to see an earlier post. 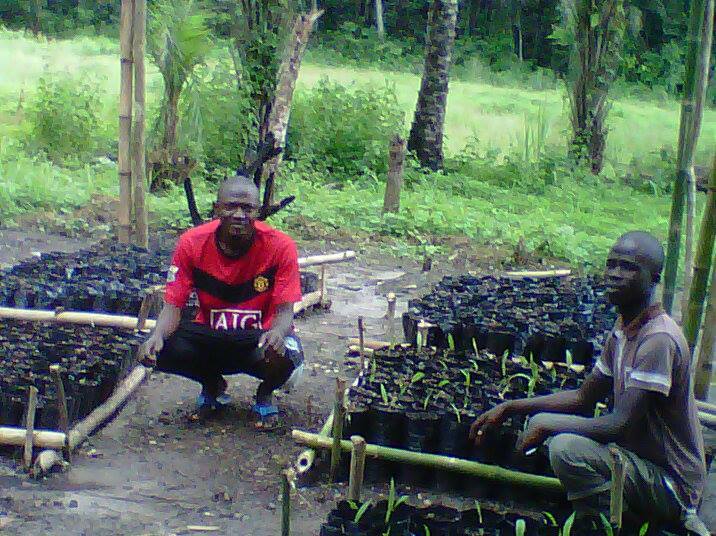 Sherbro Foundation has supported the nursery project with money to buy farm tools and young oil palm seedlings bred for early fruiting. Filling polythene bags with soil that will allow seedling to form deep roots. This looks like rich silty soil from the Bumpeh River floodplain. 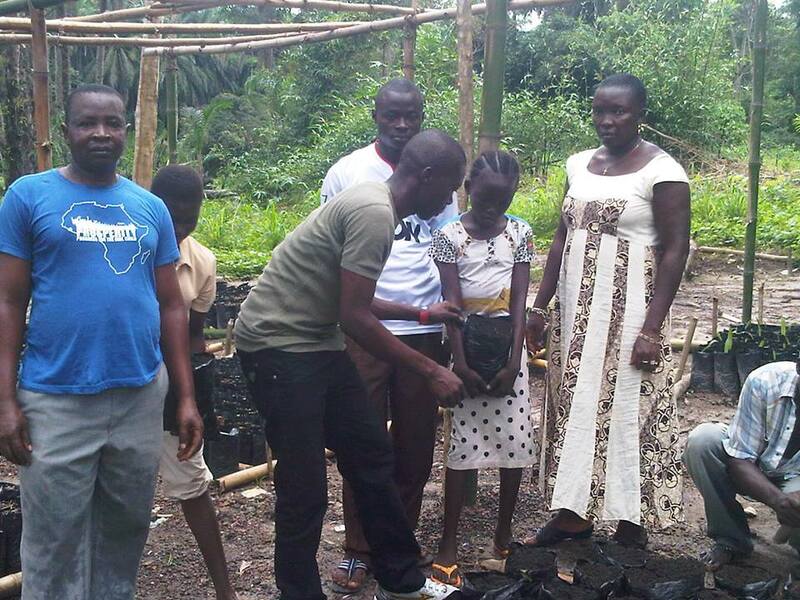 Rotifunk community gets involved with preparing the bags to hold seedlings. Seedlings will be nursed in the nursery, watered and protected from the dry season’s hot tropical sun til ready to plant next year. 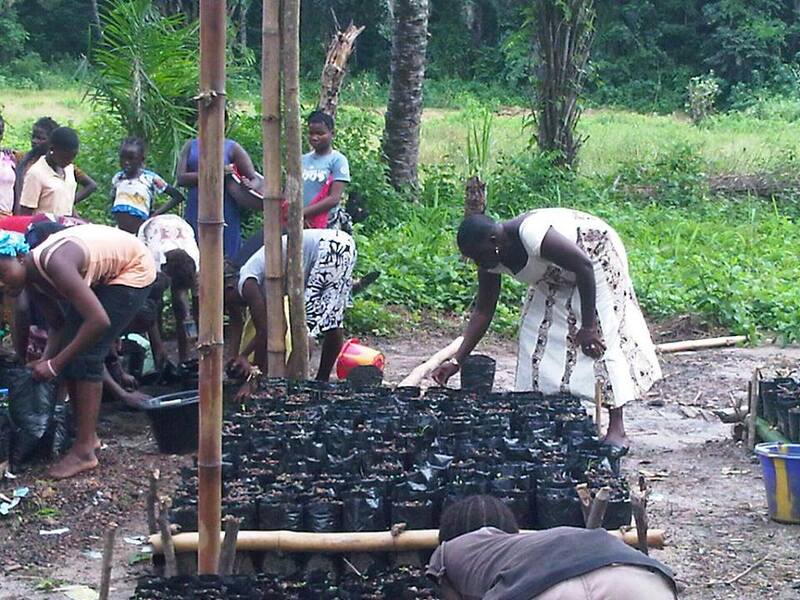 Families across Bumpeh Chiefdom are eligible to get trees at a token cost. CCET-SL volunteers and local teachers Osmun Kamara and Phillip Komoh. I’d guess these are coconut seedlings.